(GOLDENDALE, Wash., April 22, 2016) – A Kaleidoscope of Color: American Indian Trade Blankets will be on view at Maryhill Museum of Art July 16 – November 15, 2016. The exhibition will explore commercially produced trade blankets as an important facet of Indian culture, showcasing 20 pre-1925 blankets from well-known historic manufacturers such as Buell Manufacturing Company, J. Capps & Sons, Racine Woolen Mills, Oregon City Woolen Mills, and Pendleton Woolen Mills. The featured blankets are from private collections and offer a rare opportunity to see some of the most colorful items ever created by American industrial designers. Historically, North America’s Native peoples fashioned warm wearing robes from woven cotton, yucca, feathers or rabbit skins, or from tanned elk and buffalo hide. Trade blankets made by outsiders first appeared on the continent in the 18th century, when the Hudson’s Bay Company imported English “point” blankets. From 1780 to 1890, these blankets were a staple of the fur trade, especially in Canada and the northern tier states. During the same period, Navajo weavers were well known for their fine wearing blankets. But with the arrival of trading posts at the end of the 19th century, traders encouraged Navajo customers to focus on the production of rugs for sale to distant markets; this advice, coupled with reservation constraints that limited Native access to the materials needed to create their own blankets, Navajo weavers largely stopped making blankets. Enterprising American woolen mills saw an opportunity and began producing brightly-colored blankets with bold geometric designs for sale to the Native populace. 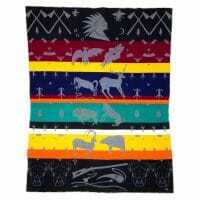 These trade blankets soon became an important part of Native culture and for general household use. Although Indian trade blankets are synonymous with 20th-century reservation style, manufacturers were dependent on sales to the non-Native population. Instead of transferring specific Native designs onto blankets, they created patterns that appealed to mainstream romantic stereotypes of Indian imagery and specific pattern names were assigned because of their lyrical quality rather than any relationship to objective origins. Trade blanket aficionados favor blankets made prior to 1942 – the year mills began manufacturing for the war effort. The majority of vintage robes still in circulation come from non-Native families as Indian people took great pride in their blankets and generally used them until they were worn out. Others were valued as burial attire and the practice of wrapping departed relatives in a new Pendleton blanket is still common in Navajo communities. Thursday, July 21 | 7 p.m.
Maryhill’s Curator of Art Steve Grafe discusses clothing as a means of individual, cultural, political, and social identity and expression. Visitors can explore the museum’s haute couture fashions in the Théâtre de la Mode exhibition, Native American and arctic textiles, and more. Cost: FREE museum members / $5 non-members. Saturday, October 15 | 2 p.m.
Join author and antique American Indian trade and camp blankets specialist Barry Friedman for a walk through the exhibition. Friedman has written two books on the subject: Chasing Rainbows: Collecting American Indian Trade & Camp Blankets (2003) and Still Chasing Rainbows: Collecting American Indian Trade & Camp Blankets, Volume Two (2014), serves as vintage blanket consultant to Pendleton Woolen Mills and is a vintage blanket supplier to Ralph Lauren. After the exhibition walkthrough, Friedman will appraise visitors’ own trade blankets. FREE with museum admission. Hi-res images for media use are available here. For further information, please contact Rachel Bucci at rachel@maryhillmuseum.org. Maryhill Museum of Art boasts a world-class permanent collection, rotating exhibitions of the highest caliber, and dynamic educational programs that provide opportunities for further exploration by visitors of all ages. On view are more than 80 works by Auguste Rodin, European and American paintings, objects d’art from the palaces of the Queen of Romania, Orthodox icons, unique chess sets, and the renowned Théâtre de la Mode, featuring small-scale mannequins attired in designer fashions of post-World War II France. Baskets of the indigenous people of North America were a collecting interest of Hill; today the museum’s American Indian collection represents nearly every tradition and style in North America, with works of art from prehistoric through contemporary. Maryhill Museum of Art is open daily from 10 a.m. to 5 p.m., March 15 to November 15. Admission is $9 for adults, $8 for seniors, $3 for youth age 7-18 and free for children 6 and under. Admission to the Stonehenge Memorial is free; it is open from 7:00 a.m. to dusk daily. Sandwiches, salads, espresso drinks, cold beverages, and freshly baked desserts and pastries, as well as a selection of local wines are available at the museum’s cafe, Loie’s, from 10:30 a.m. to 4:30 p.m. daily; the Museum Store features art and history books, jewelry, Native American crafts and other mementos.